#1 – 2017 CO State Fair’s Junior Livestock Shows, Championship Drives & Touchstone Energy Cooperatives Sale on Livestream! #3 – The 2017 Feeders and Friends Keith Spayd Benefit raises $46,000+! #5 – Watch the 2017 Colorado FFA State Convention on Livestream – Get Ready to ELEVATE! *UPDATED – 12-29-17* Make plans now to join farmers and ranchers at the 2018 Farming Evolution event on February 13 & 14, 2018. The event will be held at the Phillips County Event Center in Holyoke, CO. Plan to come if you have interest in and questions about no-till, cover crops and grazing livestock on cropland. 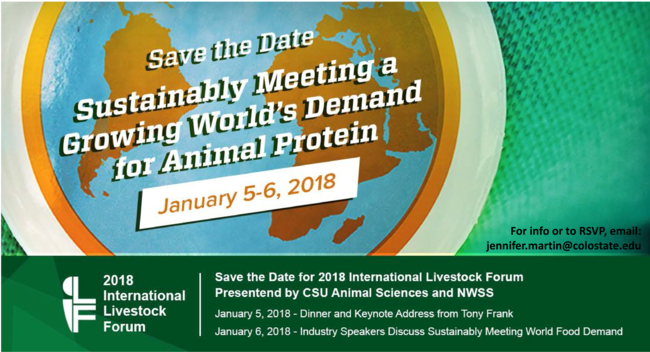 Colorado State University Department of Animal Sciences and the National Western Stock Show have partnered together to host the 4th annual International Livestock Forum. The 2018 International Livestock Forum will bring together industry leaders, government professionals, members of academia to discuss domestic and international livestock and food production. Fellows of the 2018 ILF will experience unique tours of some of Colorado’s top agricultural enterprises, behind-the-scenes access to the National Western Stock Show, and a full day of networking and interaction with an impressive lineup of keynote speakers and industry panelists. This is a premiere opportunity to engage in the future of international livestock and food production. As a part of the Global Sustainable Development Goals set in 2015, the United States made a commitment to help end global food insecurity by 2030. America enacted the Global Food Security Act in 2016, which seeks to reduce food insecurity and poverty in a variety of ways, including agricultural growth and a broad commitment to improved nutrition. Improvements in global food security are measured by assessing factors like food availability and food access. The Food and Agriculture Organization of the United Nations says the percentage of undernourished people in developing countries around the world dropped from 23 percent to 12 percent between 1995 and 2015. The International Food Security Assessment finds that undernourishment has more than halved from 1995 to 2015 in the 76 low-and-middle-income countries that the USDA regularly tracks. Almost 40 percent of the world’s children were stunted and 25 percent were underweight in 1990. That number has dropped to less than 25 percent stunted and less than 15 percent underweight in 2015. While advanced biofuels are still thought of as the next generation of renewable fuels, corn-based ethanol still makes up most of the nation’s fuel supply. An Agriculture Dot Com article says, in addition to reducing the carbon footprint for America’s vehicles, bio-based ethanol was supposed to provide jobs to rural communities and give farmers new revenue sources. Ten years’ worth of federal incentives were supposed to encourage investment in cellulosic technologies, but just three plants have been built in the Midwest since 2014. Cellulosic ethanol is much harder to manufacture than grain ethanol because it uses the inedible parts of plants, making it harder for machines to process. Cellulosic companies also faced challenges like finding a steady supply, fluctuating markets, and stalled policy decisions. Of the three major plants in the Midwest, the one in Kansas went up for sale in 2016. DuPont announced in November that it’s looking for a buyer to take over its plant in Nevada, Iowa. That just leaves Project Liberty in Emmetsburg, Iowa. The industry also wasn’t helped by the Environmental Protection Agency, which lowered 2018 the cellulosic ethanol mandate in the Renewable Fuels Standard but not by as much as it initially proposed. A Drovers article says officials in Brazil are still expecting to resume exporting fresh beef product to the U.S. early next year. The Brazilian Ag Minister spoke at a recent news conference, saying that his country expects beef exports to the U.S. will “resume very soon.” However, the USDA still hasn’t commented on whether or not they will lift its ban on fresh beef from Brazil. It was back in June that the U.S. suspended beef imports from Brazil over safety concerns. That came after the U.S. had previously rejected 1.9 million pounds of Brazilian beef from March to June. Authorities say the rejections came from abscesses on the meat products caused by a bad reaction to the Foot-and-Mouth vaccine. Brazil is the world’s largest beef exporter and the country is forecasting exports to grow by 10 percent next year, after going nine percent higher in 2017. The nine percent increase came in spite of a corruption scandal that led to food safety concerns and the temporary loss of export markets around the world. The bullish projections are based, in part, on the U.S. lifting its ban next year, as Brazil is expecting. The U.S. Meat Export Federation has filed comments with the Mexican government regarding its concerns about the country’s beef grading standards. A Meating Place Dot Com article says Mexico’s system closely resembles the one used by the U.S. Department of Agriculture, using the names “prime,” “choice,” “select,” and “standard.” However, where it’s different is the government’s plan to use the names interchangeably. The USMEF says the plan will create confusion in the beef marketplace and diminish the value that the U.S. beef industry derives from the USDA grading system. Other differences between the Mexican and American systems include marble-scoring and the procedures used to determine carcass grade. Those differences make the interchangeable use of English and Spanish grade names problematic. USMEF says, “Beef carrying any of the Mexican grades will not be comparable to beef that’s been given a parallel USDA grade. This will pose a problem in the marketplace as those grades represent standards that are well known in Mexico and around the world, as they’ve been used many years.” USMEF wants the Mexican grading system, which the government wants to make mandatory, to stay voluntary and for the government to remove the English grade names from their program. The orange juice futures trade is stuck in the biggest rut it’s seen since way back in 1967. The futures closed lower for a record 15th-straight day last Wednesday, with no end in sight. Domestic demand for orange juice has been shrinking for several years. On top of that, add in a declining citrus crop in Florida, the nation’s number-one supplier, and investor interest has also shrunk because fewer people want to use futures to hedge risk. Prices have slumped approximately 17 percent in December. The liquidity drain out of the orange juice futures market is even limiting volatility in price swings. The volatility swings were at their lowest point since November of 2014. The Florida citrus harvest is forecast by the government to hit the lowest point it’s been at in the past 73 years. Surging imports from Mexico and Brazil are making up for the domestic shortfall.